In a large sauce pot, add the chicken and 4 cups [8 cups] water, making sure the breasts are separated, and bring to a boil. Cook over high heat until opaque and cooked through, 5 to 7 minutes. Using a slotted spoon or tongs, transfer the chicken to a plate to cool, then, using a fork, shred the chicken. Strain the poaching liquid through a fine-mesh strainer and return it to the pot; cover to keep warm. Peel and thinly slice enough shallots to measure ⅓ cup [⅔ cup]. In a large frying pan over medium heat, warm 1 to 2 tablespoons oil until hot but not smoking. Stir in the shallots and garlic and cook until fragrant, 1 to 2 minutes. Add the cauliflower “rice,” season with salt and pepper, and cook, stirring frequently, until the cauliflower starts to soften, 3 to 5 minutes [4 to 6 min]. Remove from the heat and season to taste with salt and pepper. While the cauliflower cooks, prepare the remaining ingredients. Coarsely chop enough dill to measure 1 tablespoon [2 TBL]. Save any remaining dill for another use. Crack the eggs into a medium heatproof bowl and season with salt and pepper. With a fork or whisk, lightly beat until just blended. Bring the chicken poaching liquid to a simmer. In a slow stream, gradually whisk about 1 cup hot liquid into the bowl with the eggs until blended. In a slow stream, gradually whisk the egg mixture into the simmering poaching liquid until incorporated. Stir in the shredded chicken, cauliflower “rice,” parsley, dill, lemon zest, and 2 tablespoons [¼ cup] lemon juice and cook until warmed through, 1 to 2 minutes. Remove from the heat and season to taste with salt and pepper. Transfer the soup to individual bowls, drizzle each serving with 1 tablespoon oil, and serve. Measure the shallots and garlic. 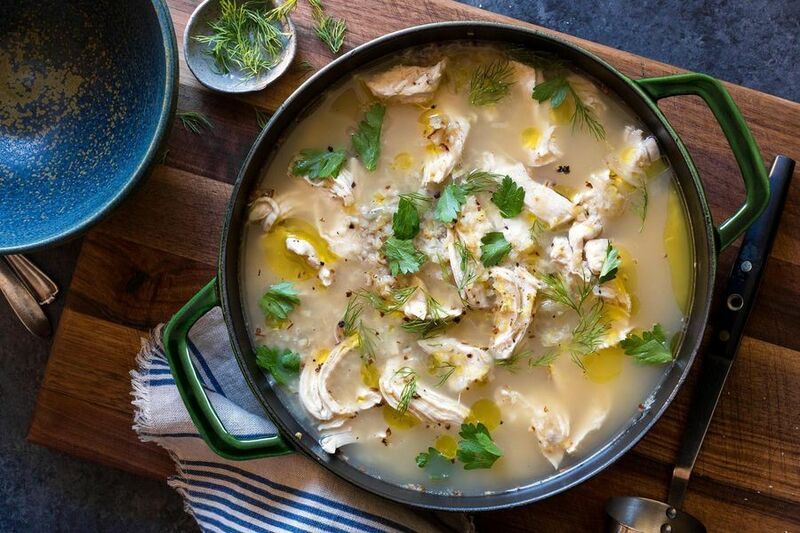 Avgolemono, an egg-lemon soup, is traditionally served on Christmas Eve in Greece, but this delicious, easy-to-make dish is delicious all year long. Use only 2 teaspoons oil to cook the cauliflower rice and you’ll cut 20 to 80 calories and 2.5 to 9.5 grams of fat from each serving. Skip the final drizzle of oil over the soup and save an additional 60 calories and 7 grams of fat per serving. Calories: 520, Protein: 48g (96% DV), Fiber: 5g (20% DV), Total Fat: 29g (45% DV), Monounsaturated Fat: 18g, Polyunsaturated Fat: 4.5g, Saturated Fat: 5g (25% DV), Cholesterol: 280mg (93% DV), Sodium: 180mg (8% DV), Carbohydrates: 16g (5% DV), Total Sugars: 6g, Added Sugar: 0g (0% DV).